A small goat with a disability stars in this animal-rescue success story. 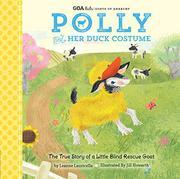 Already the subject of several online videos, Polly is introduced here with cozy painted illustrations centering on a floppy-eared kid and featuring only partial views of her white human “mom.” Virtually blind and taken in by Lauricella, the proprietor of a New Jersey rescue facility called “Goats of Anarchy,” Polly finds comfort swaddled in a soothing blanket at first. But that slips off when she wanders around the house, so she is dressed in a toddler-sized Halloween duckling costume—a solution that not only keeps her content but cranks the cuteness factor up about a thousandfold as she draws a diverse audience of fascinated children at the grocery store and later gambols in a grassy field with Pippa, another rescued kid who becomes a constant companion. The author adds anthropomorphic language to this simple profile (“ ‘Where’s my mom?’ wondered Polly”) but closes with notes on Polly’s “true story,” illustrated, rather counterintuitively, with photos of the caprine fashion plate modeling several outfits.